In vitro meat probably won’t save the planet, yet. Some hope that creating meat without any animals will save energy. But that might not be the case. 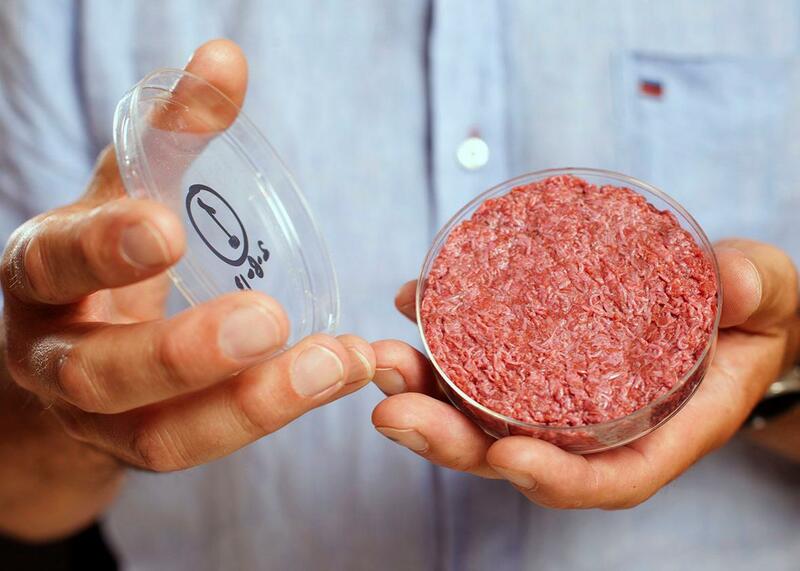 Professor Mark Post holds the world’s first lab-grown beef burger during an event in West London on Aug. 5, 2013. The Industrial Revolution is sometimes described as the replacement of animal labor, fueled by agricultural inputs, with machine labor, fueled by industrial energy. In the early 20th century, tractors all but replaced horses and other work animals on American farms, rapidly industrializing food production. This transition reduced the cropland required to feed work animals: In 1913, an estimated 28 percent of all harvested acres were required to feed horses and mules. But it also increased fossil fuel consumption. In the coming years, we may face a similar shift: Emerging technologies could allow meat to be grown in factories rather than in animals. Conventional wisdom holds that this new process of cultured, or in vitro, meat production will be an environmentally friendly alternative to livestock rearing and will reduce the greenhouse gas emissions, energy consumption, land use, and water use associated with meat production. Some even argue that the shift to in vitro meat could save the planet. Indeed, early research suggested that it could have a smaller environmental footprint than traditional meat. But the reality may turn out to be more complicated. We recently completed a study that suggested swapping out the meat in a hamburger could have mixed environmental effects. Cultured, or in vitro, meat is edible muscle (and perhaps fat) tissue grown from animal stem cells in a factory, or “carnery.” It is essentially meat that does not require animals to be slaughtered; in theory, thousands of pounds of meat could be produced from a small sample of living tissue. The first cultured hamburger was tasted in London on Aug. 5, 2013, and the startup firm Modern Meadow took cultured “steak chips” to the South by Southwest Interactive festival in March 2014. Even though meat grown with this process may not appear in stores and restaurants for a number of years, when and if it does become commercially feasible, some speculate that an array of novel foods could become available—possibly even meat from extinct species. As cultured meat makes the long journey from hip technology expos to supermarket aisles, we wanted to learn more about what environmental changes could be expected if cultured meat replaces traditional meat as a household staple. While still speculative, our study found that cultured meat could require smaller quantities of feed crops and agricultural land than livestock to produce an equivalent amount of food. That’s good news! But these savings could come at a cost. Cultivation of in vitro meat requires more industrial energy—often produced by burning fossil fuels—than pork, poultry, and maybe even beef. As a result, the global warming potential for cultured meat is likely to be higher than that of poultry and pork but lower than that of beef. The reason for these differences is that animals must perform a variety of functions to build muscle mass: They must digest food, circulate nutrients and oxygen, maintain an optimal body temperature, and protect against disease. Food energy fuels these processes in organisms, but carneries will have to use industrial energy, i.e. fossil fuels, to accomplish the same tasks. For example, unlike animals, meat grown in a factory will not have an immune system. That means everything that touches it must be sterilized to avoid contamination with harmful microbes. Both heating water and using chemicals for sterilization could require a great deal of energy. To complicate matters even further, meat is not the only product derived from livestock. Inedible components such as blood, internal organs, hide, and feathers are used for a variety of applications including leather, cosmetics, pharmaceuticals, and many other household and industrial products. Traditional meat production is often an inexpensive source of these substances—some of which may not have ready human-made substitutes whereas others are considered lower in quality by some (think pleather or vegan leather). In any event, synthetic substitutes could have greater environmental impacts than animal sources, or cost more, or both. For example, Modern Meadow is already working to develop in vitro leather. It’s too early to estimate the cost, but growing skin cells in a factory may turn out to be more energy-intensive than using cowhide. No working carnery yet exists, and in vitro techniques are likely to advance rapidly in the coming years—so it’s essentially impossible to accurately forecast what the first industrial process will look like. From this perspective, all projections of specific environmental impacts are almost certainly wrong, and it may be years before we know how far off we are. Moreover, the large-scale environmental impacts of cultured meat will depend on the degree of adoption; the energy sourced for production; the methods used to cultivate it; the shifting patterns of livestock production; and the substances, if any, found to replace animal byproducts. To complicate matters even more, shifts in other areas, like expansion of biofuel production, could offset decreases in required agricultural land. The world is getting hungrier for meat every year. To offset increasing demand, startups like Beyond Meat are developing plant-based meat-esque alternatives, and the United Nations suggests we pick up a tasty cricket patty. Add technologies like cultured meat and the future is likely to offer a dizzying array of new foods—all with particular culinary characteristics and unique environmental footprints. Given the potential impact of global consumption, it’s worth exploring the opportunities and drawbacks of new products and technologies before we start building factories, designing logos, and getting late-night cravings for dodo nuggets.